*Attendees please head to the 10th floor upon arrival for check-in before proceeding to the rooftop. 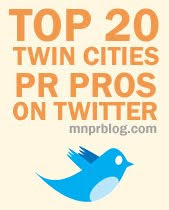 Calling all Twins fans and public relations professionals! The next Minnesota PRSA Meet & Mingle is for you. You will have the opportunity to network with some of Minnesota’s best and brightest public relations professionals on a downtown rooftop with Target Field as your backdrop. Hosted by Carmichael Lynch Spong, this rooftop experience will provide you the opportunity to learn more about the award-winning agency from President Doug Spong. Parking: The best ramp option is Ramp C on the corner of 4th St & 2nd Ave. North. Light rail is another great option if it’s accessible. Please allow extra time for traffic as the Twins game is the same night. Thank you in advance to our sponsor, Carmichael Lynch Spong for your support of Minnesota PRSA programming!